It was a year ago, in March 2017, when I listed the various kinds of more than 200 trees that were being planted as part of Albany’s downtown streetscape beautification program. 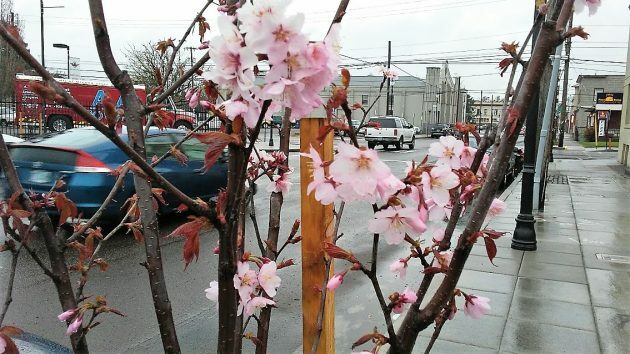 On Lyon Street, the plan called for several blocks to be lined with trees called “Pink Flair Cherry.” That variety was chosen because it gets only about 25 feet tall and would not interfere with overhead wiring. But it also showed promise from the visual angle in terms of cherry blossoms in the spring. Well, those intrepid little cherry trees apparently think it’s time. In their first year in their new home, they are doing their stuff just as promised by their name. Nothing like Spring to remind us curmudgeons that ongoing life is a blessing to all.